I’ve always been a morning person. I’ve never been able to sleep in. I’m not sure when it all started, but it seems that as far back as I can remember I’ve been an early riser. My favorite day of the week to be up early is Sunday. Sunday has a totally different feel for me than any other day. There are times when I have to get up at 4:30 on a Sunday morning to catch a flight. The thought of getting up that early is never all that appealing, but once it happens, once I’m out the door, I absolutely love it. It just seems so awesome, so pure, so mind awakening. I do my best thinking early in the morning. For those of you who get to work early every day, you know exactly what I’m talking about. I believe getting up early on a Sunday morning and using that time to think or work can be the most productive time you will ever have. Two solid hours on a Sunday morning is probably more productive than 6 or 8 hours at work. Got an issue you’re trying to solve? Looking for creative ideas to set you apart from the competition? Still trying to solve that recon problem? Can’t figure out the structure of your management team? Looking for ways to hold people accountable? Need a new sales pay plan? Got questions? Need answers? Give yourself 2 hours on Sunday mornings. While there may be some statistical data with 20 groups telling what dealers are averaging as a percentage, that doesn’t mean that there’s an acceptable number to be shooting for. My answer to the question is, “There is no number.” Having said that, if you’re the Dealer or General Manager it’s a number you should always keep your eye on. I’m a bit old school, but as a dealer I looked at every retail deal and every wholesale deal once it had billed and booked. My initials went on every deal. I wanted to plant the seed in the used car manager’s mind that I was always looking at these units that were being wholesaled. What I was trying to do was create a little element of doubt as to whether we could have retailed this unit. I know that there may be some dealers who may not agree with this statement, but I truly believe you should retail everything that has a breath of life left in it. Why should you let someone else gain a customer and make the money? Sure, you will have some issues. But the pluses far outweigh the minuses to wholesaling a lot of units. We are in the retail automobile business and we should retail everything we can. I travel a lot. I travel an awful lot. Big cities, small cities, big towns, small towns and all sizes in between. In most cases if I closed my eyes I could be in any city. They all look the same. With the exception of the terrain if I didn’t know where I was, I wouldn’t know where I am. They all have Wal-Mart, Walgreens, Target, Home Depot, Applebee’s and the other familiar places. There’s not much difference in any of the cities I go to except some are bigger, some are smaller. Same thing with dealerships. As I think about your dealership, I’m wondering what makes you different. What’s your defining proposition? Why should people want to do business with you? But somehow, someway you have to figure out how to be different. It’s easy to be like everyone else. When you’re like everyone else you become average and to some degree, even boring. Who wants to be average? You may not want to be average, but you will continue to be so until you figure out how to be different. One of my favorite things to do when working with dealers is to discuss their oldest used vehicles in stock. If the oldest unit is 55 days old or 155 days old, 99.9% of the time they all have a storyline tied to them. Some of you won’t like my response. But, my response is based on reality. And the reality is, if it’s priced #1 in the market and it still hasn’t sold…it’s not cheap enough. We’re not talking about a fresh piece. We’re talking about your oldest unit in stock. And, it may have a flaw you failed to identify soon enough. You’ve had it way too long. It’s time to make it “cheap enough” and make it go away. On Saturday Feb. 7, 2015, Dean Smith, one of the all time greatest coaches in college basketball history passed away. It wasn’t so much that he was a great basketball coach as it was about how he coached young men along the road of life. As many of you know, I was an NCAA college basketball referee for 17 years. My first experience with Coach Smith was somewhere around 1983 when I was assigned to work a scrimmage game at UNC. It has always stuck in my mind as to how everything during that scrimmage/practice session was timed, precise and disciplined. Outstanding processes to say the least. When a player was corrected or coached by any of the members of the coaching staff, the comments were always followed with a “Yes sir, no sir.” Not a lot of discussion from the player’s side. The previous week I had worked a similar scrimmage at the University of Maryland coached by Lefty Driesell. The environment was totally the opposite. Lefty never achieved the type of success that Dean had. There’s a lot to be said about running a disciplined organization. Dean Smith coached from 1961 to 1997 and retired with 879 victories. His teams won two national championships and appeared in 11 Final Fours. Even greater than all his wins is that 96.6% of his athletes received their degrees! Coach Smith recruited the university’s first African-American basketball player, Charlie Scott. Though Dean Smith didn’t actually invent the four corners offensive tactic, he made it famous. Today’s shot clock is a result of Coach Smith’s utilization of the four corners. Perhaps his most famous player was Michael Jordan. 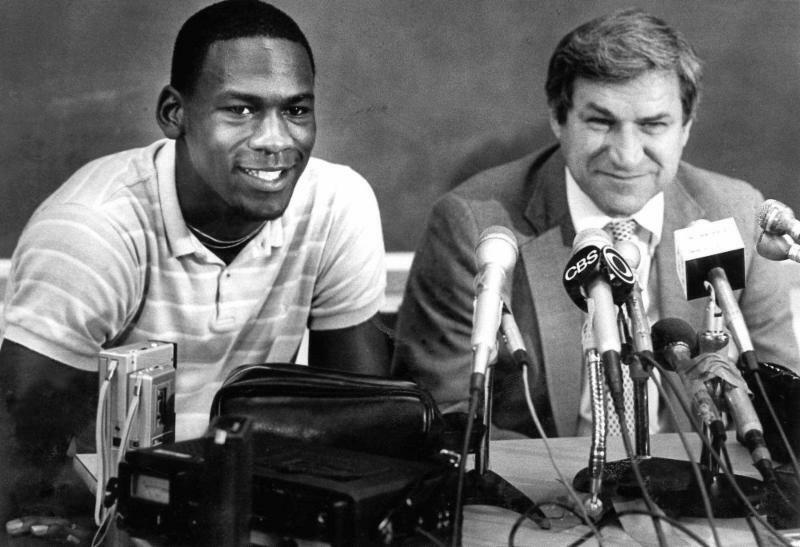 It’s often stated in a joking manner that Dean Smith is the only person to hold Michael Jordan under 20 points. Coach Smith’s teams were all about teamwork. Even Michael Jordan had to pass the ball under Coach Smith’s offense. It’s Pretty Good, Isn’t It? Business has been pretty good hasn’t it? If you have access to the financial statement take a peek at your net profit to sales percentage. Are you in the 4 to 6% range? If you’re only in the 2% range, you could be in trouble when business starts to go south. Historically in this business dealers make the most money when they are coming off of tough times. That’s easy to understand. When things get tough dealers tighten up on expenses and get back to basics. Thus when the worm starts to turn, dealers rock the bottom line for a short period of time. But as we all know, the better business gets the sloppier we get. It’s been very good for a number of years now. So, where are you? Are you letting things get out of hand? Are you making money in spite of yourself? Is it the market or is it you that’s making it happen? 1. Have you dissected every expense on the expense page? 2. Do you have too many people in the wrong places and not enough in the right places? 4. Are you evaluating every trade that you don’t make? 6. Are you doing a trade walk? 8. Are you evaluating all the wholesale pieces to see if they have life in them? 9. Do you have a photo booth and is your website the best it can be? 10. Have you shopped your own dealership? Have you shopped CarMax? 11. Do you hold your staff accountable? 12. Can you shorten your selling process? 13. Are you using vAuto to buy and price your units correctly? 14. Do you have the right staff that’s getting daily coaching & training? 15. Are you still doing business the same way you did 10 years ago? 16. What’s the turnaround time for a used car from the time you own it until the time it’s ready for the line? 17. Are you leading the way or are you talking the way? 18. Are you mining your customer base for nice used cars? 19. Are you relying on packs to save your gross profit? 20. Are your pay plans old, outdated and not in tune with today’s market? 21. Is your volume and gross going up or down? 22. How many turns a year are you getting with your used inventory? 23. Are you tracking ROI/GAP? 25. When was the last time you let Tommy Gibbs help coach you? You’re not ready. That’s different than being not prepared. You’re never ready. But, no one is ever ready for the next step. You’re not ready for the next promotion. You’re not ready for your next store. Just because you’re not ready doesn’t mean you don’t prepare. Not being prepared means you haven’t studied enough. You haven’t read enough. You haven’t sought the right mentors. You haven’t listened enough. You haven’t asked enough of the right questions. You haven’t explored the Internet enough. Not being prepared means you just haven’t done enough. Which Year Models Should You Focus On? 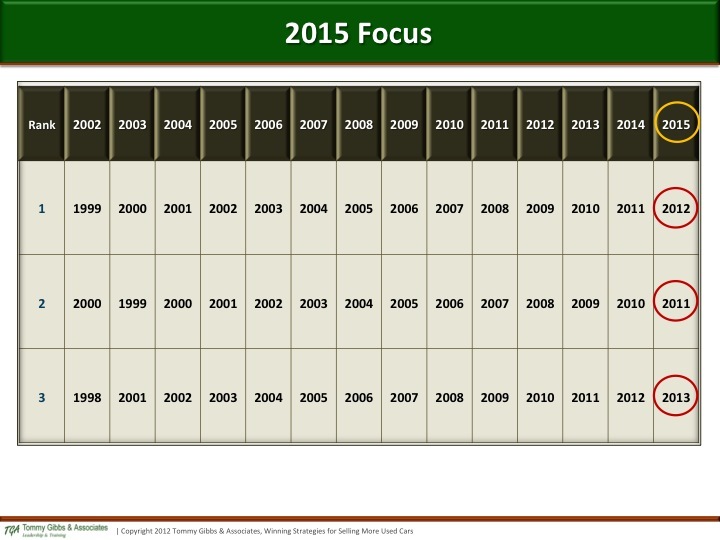 Did you know that for the year 2015 you need to focus on year models 2012, 2011 and 2013s in that order? I’ve studied this and researched it for years. Unless there is something strange and unusual about your market here’s the way it has been going back to 2002. If you get a chance to appraise a car that happens to be any of these year models you need to think long and hard before you try to steal it. These units are going to turn more or less regardless of the make or model. Of course you’re still going to use your vAuto appraisal tool, but these units generally fit a price point that more buyers can afford. I would suggest you further research this by using the Experian tool called Auto Count USA. It will give you the top selling models for your market. Use this SHEET to list them and keep a focus on the year models listed at the top of the page. I’m often telling you things you already know, because I know how easy it is to lose focus.